The unmistakable and distinctive growl of the North American T-28 Trojan is a favorite sight and sound at airshows. Proudly keeping this famous aircraft in flight is the T-28 Trojan Phlyers Flight Demonstration Team. The team has selected Trig Avionics as their ADS-B and VHF avionics of choice. Trig is supporting the Trojan Phlyers – a core team of ten pilots work tirelessly to maintain and operate three historic T-28 aircraft. The Trojan was one of the last piston engine aircraft to see service in both the U.S. Air Force and Navy, in both training and combat roles. Over 1,900 Trojan’s were built and operated by 28 countries around the world. As team leader of Trojan Phlyers, tell us about how you first got into aviation? When I was a child, my father was learning to fly. He would work Saturdays and Sundays at the airport, and the airport would pay him with an hour of flight instruction. While my father worked or took flight instruction, I would hang out at the airport. Over time I developed an interest in flying and started flight lessons at age 16 at the same airport as my dad. With all your experience, what’s the most helpful advice or encouragement that you would give to low hours pilots? Every long journey starts with a single step… so remember that each flight and each hour of flight time is part of the journey to your aviation goal to be a private pilot, military pilot, or airline pilot. And besides, the journey is fun. Tell us about the team, what are the challenges of operating the T-28, what do you enjoy? The costs of operating and maintaining the aircraft can be daunting, and some aircraft parts are hard if not impossible to find. But when everything is working, and my wingman is tucked in tight, the flight experience is its own reward. What is the T-28 like to fly, what do you most appreciate about the aircraft, does it have any vices? The T28 was built to be a military trainer, so it was designed as a high performance, rugged, fully aerobatic aircraft. Those three attributes are what attract me to it. With the big radial engine up front, the aircraft is nose heavy and so a pilot needs to pay special attention to nose attitude when doing aerobatics otherwise an inattentive pilot might find themselves in an uncomfortable nose low recovery. You will be displaying this summer, what can folk at shows look forward to seeing? 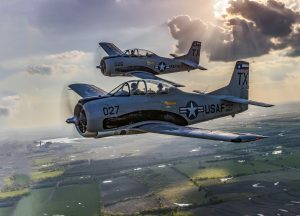 My wingman and I will be doing some close formation (always exciting on windy days), and folks can see the maneuverability of the T28 as we do aerobatics. She (the T28) may be old, but she can still dance! How much smoke oil do you burn in a display? In an average display, we’ll burn about 10 gallons of smoke oil per aircraft. How are the team getting ready for ADS-B? To meet the mandated FAA ADS-B Out requirement, we have opted to install the Trig Experimental ADS-B Bundle. The Trig Experimental Bundle solves two problems for us… we replace our old, dated transponders with new Mode S transponders, and we have an ADS-B Out solution included. We are installing the compact TT22 transponder which drops right into an empty hole in our instrument panel. Why have you chosen Trig as your ADS-B options? We had previously installed Trig TY91 compact radios in our aircraft, and knew them to be a good product, so when we were looking for an ADS-B Out solution, we naturally looked at what Trig had to offer. Having established contact with Trig, the company are now sponsoring your team – where can pilots see you this season? We are currently scheduled for four air shows in Texas, two in Missouri, and we will be flying in the skies over Wisconsin during Air Adventure. Our website www.trojanphlyers.com will have our updated flying schedule. In your long flying career what’s the best flight that you’ve ever had to date, and why? Hard question… hard because I find it difficult to pick a single flight. It could be a late-night flight in an F4E over the North Sea looking for Russian bombers, but watching the Northern Lights instead. Or it could be a combat sortie in an F16 in the skies over Iraq… but it’s probably my first solo flight as a teenager in a Cessna. The Trojan Phlyers can be seen at displays across the summer, as a salute to T-28 veterans past and present. For more details visit the Trojan Phlyers website here.